Karma is a funny thing. I emailed the dealer wanting to know if my lovely new bike was going to come at the end of the month or the end of the summer. Nothing. Not a word. So I get all paranoid and start looking at the classified ads on Kijiji. For some reason (I call it “being tighter than a Nun’s nadger”) Canadians don’t really do Ebay, so there is this truly terrible free ad site where people sling things and see if the insane prices will stick. That’s my general idea of it because some of the prices can only be considered a really bad joke. So I look at the only real viable alternatives to the Africa Twin; the BMW800GS and the KTM 990 Adventure. Now.. if you have been a total obsessed imbecile who trawls these nasty free ad sites regularly, as I do, you see patterns of items that just hang there like a bad smell. One of those smells is a KTM990 that has been hanging around there since I have been looking (read: All Year). I’m not adversed to a few miles on a bike, but when you are as proficient an internet stalker as me then you can see the exact same bike on someone’s Facebook page taking part in some pretty serious off-road events you tend to shy away. Especially if it has ‘Club Cappuccino’ miles on it. I realise these bikes should be used, but I would prefer to buy mine from someone who polishes it on their driveway then rides it on the road to a Starbucks in the next province. Then this BMW F800GS pops up. Hello?! Less than 10,000km and $10K, that’s a ratio I like the sound of. Something not to pass up! 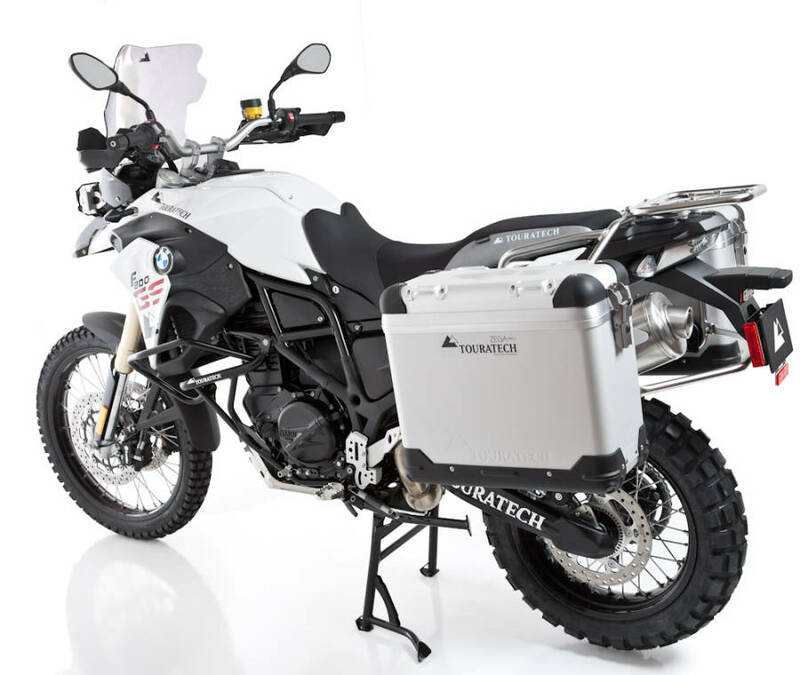 It has a full compliment of Touratech Farkles too, including crash bars and panniers. Nice. I email the bloke and get the usual Quebecois one line answer. This may be a point at which to explain the vast cultural difference between my largely British social upbringing and that of the Quebeccer. When one is selling an item and a potential buyer inquires: “Oh, that’s a lovely melon, does it have any scuffs?” the seller should use this as an ice-breaker and an opportunity to open a dialogue with the potential customer.. “It’s a lovely shiny melon and the last one I had tasted really good too”. Boom! a conversation and maybe a bit of banter. Nope just: “The service receipt is in a drawer.” Jeepers dude. Have some humility and strike up a conversation. I ignore this, now commonplace event and chalk it up to my ignorance of the culture of the people and make plans to drive over to see it. He says “call when you’re on your way”. Beforehand I do the studious Google maps search and figure out which is his house; I like to be prepared (maybe I should have been in the Selous Scouts?) and as such I also figure that he is probably selling his wife’s or his own bike. Maybe he’s getting a divorce? So I know where he lives and start the 30min drive over. We call… nothing. We get closer, call again… nothing. The highway turn-off comes up and I know the house is just over the rise of the off ramp. There he is, on his driveway, with the bike, talking to a bloke in BMW Adventure pyjamas. They’re doing that ‘relaxed chat; deal done’ thing people do when they have come to a deal on a used car and can drop any pretences. We cruise past and call him again. We get an answer this time and he says “it might be sold” and that he would call back. Off to the petrol station and… Nothing. Karma ate that one and told me not to buy a BMW. So we went for a drive the long way home and gatecrashed a Dressage competition. Horses, no matter how shiny, smell. This entry was posted in Bikes, Farkles, Motorbike. Bookmark the permalink.